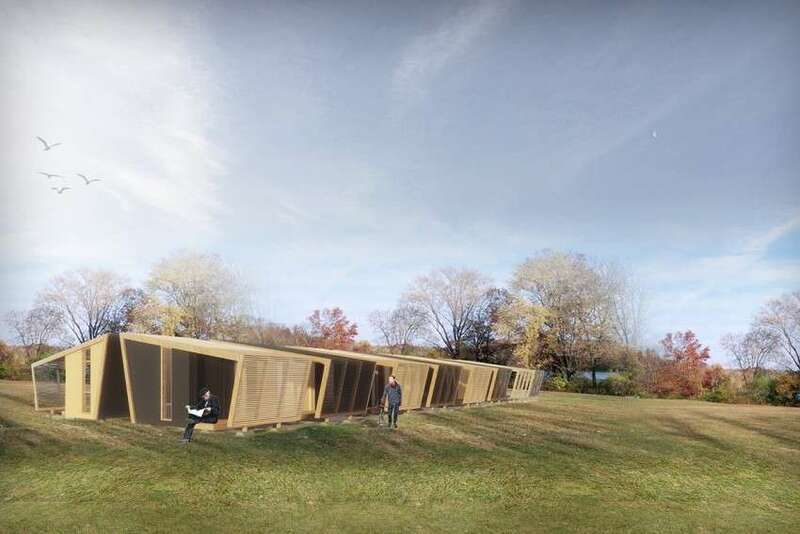 A rendering of the Bridge Housing Community’s proposed sleeping cabins. Image: Gensler. A 2017 homeless census counted 4,350 homeless individuals in San Jose; 74 percent of them sleep outside regularly rather than in shelter beds. Santa Clara County emergency shelters only have the capacity to provide 1,253 beds on any given night, just over 1,000 of them in San Jose. With an insufficient supply of shelter beds, the city continues to look to short-term housing interventions to address the need, including four warming locations provided during cold, rainy weather and two recently converted hotels that offer 102 new units for interim housing. Another promising step is a new pilot project from the San Jose Department of Housing: the city’s first Bridge Housing Community, a micro community of 40 sleeping cabins and community spaces to be placed on city-owned property. Homelessness is a growing challenge for the region. In all nine Bay Area counties, the majority of people experiencing homelessness do not have even temporary emergency shelter options, which makes the region quite different from East Coast metro areas with large homeless populations. As San Jose and other Bay Area cities move toward piloting short-term interventions, service providers such as the Housing Trust Silicon Valley, Destination Home, HomeFirst and PATH are important partners in creating housing with wrap-around services to address the compounding issues faced by homeless individuals. Voters in cities and counties throughout the South Bay have proven their commitment to addressing homelessness by passing generous funding measures, including Santa Clara County’s unprecedented $950 million bond measure passed in November 2016. Nevertheless, San Jose city leaders are facing community push back as they explore sites for the Bridge Housing Communities pilot. While the city council originally set out to lay the ground work for building Bridge Housing Communities in each of the city’s 10 districts, the public’s concerns have prompted the city to move forward with just one location. 1. It provides a key piece of the affordable housing puzzle. Affordable housing solutions come in many shapes and sizes, ranging from inclusionary units within market-rate condo buildings to 100 percent affordable developments that provide social services on site. As we’ve written about before, long-term affordable housing developments with services are cost efficient, help people get off the streets and enhance the streetscape of their neighborhoods. The bond measure mentioned above will help generate new affordable housing options, but it takes time to build permanent housing. As developers, nonprofits and cities work to advance these units, temporary, small-scale options are needed to fill the gap between life on the street and permanent housing. 2. It leverages state and private sector tools to pilot solutions. The Bridge Housing Communities pilot leverages state policy, pro bono private sector support and nonprofit expertise to form an innovative partnership with the City of San Jose. Since the closure of California’s redevelopment agencies, cities across the state have scrambled to find new partnership models for funding affordable housing. Assembly Bill 2176, effective January 1, 2017, amended the California Shelter Crisis Act to authorize a five-year pilot program allowing San Jose to declare a shelter crisis and create Bridge Housing Communities. In December 2017 the San Jose City Council approved the selection criteria for determining appropriate sites and directed city staff to identify no more than one site from each council district. 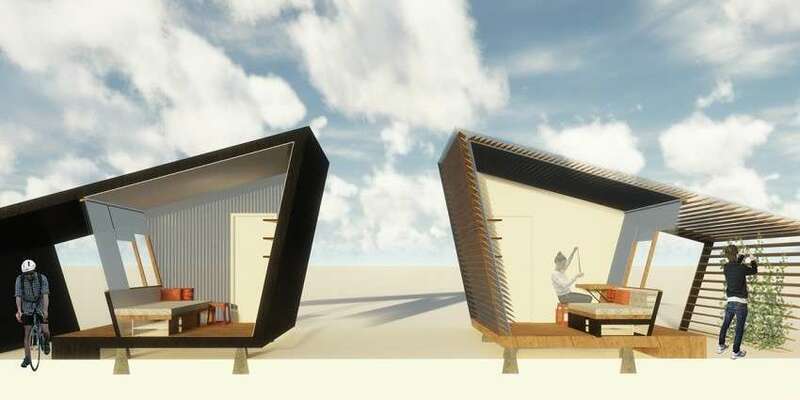 Gensler designed the Bridge Housing sleeping cabins and community spaces as part of a pro bono partnership with the City of San Jose. Finally, Habitat for Humanity and HomeFirst, two well-respected service nonprofits, are committed to developing and managing ongoing operations of the Bridge Housing Communities. The innovative public, private and nonprofit partnership behind the Bridge Housing Communities sets the pilot apart and positions it for success. 3. It promotes dignity for residents and neighbors alike. When compared with other temporary housing strategies, the Bridge Housing Communities model falls in the middle range of cost. Two of the approaches listed here provide the most permanence, amenities and support: master leasing (renting units through the broader rental market in partnership with a nonprofit operator) and rapid rehousing (quickly placing individuals and families back in housing through assistance programs that may include temporary rent subsidies and services). However, these programs are dependent on availability in the local rental market: The high cost of units and tight market in San Jose slow their effectiveness. Meanwhile, more expedient solutions like safe parking or sanctioned encampments are lacking in stability, permanency and dignity. By creating well-designed micro-communities that nest within existing neighborhoods, Bridge Housing Communities offers a middle path: a rapid response that reduces tent encampments and street garbage, leading to improved quality of life for both residents and neighbors. San Jose’s Department of Housing will return to the San Jose City Council in mid-August to select the pilot site. The goal is to have the pilot community up and running by the end of 2018.